The outdoors is calling your name! Just imagine relaxing under the power awning as you plan your day with your camping friends. All the kids will probably be riding bikes around the campgrounds while you make them lunch in the full kitchen. If it starts to rain you can dine inside at the dinette or while sitting on the sofa. The full bathroom will keep everyone clean and ready for the next activity. 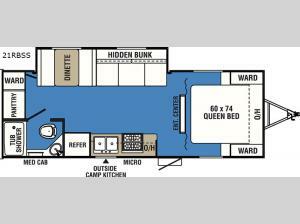 You can easily sleep five people with the queen bed in the front bedroom, plus on the furniture in the single slide out as well as the hidden bunk. Take a look!